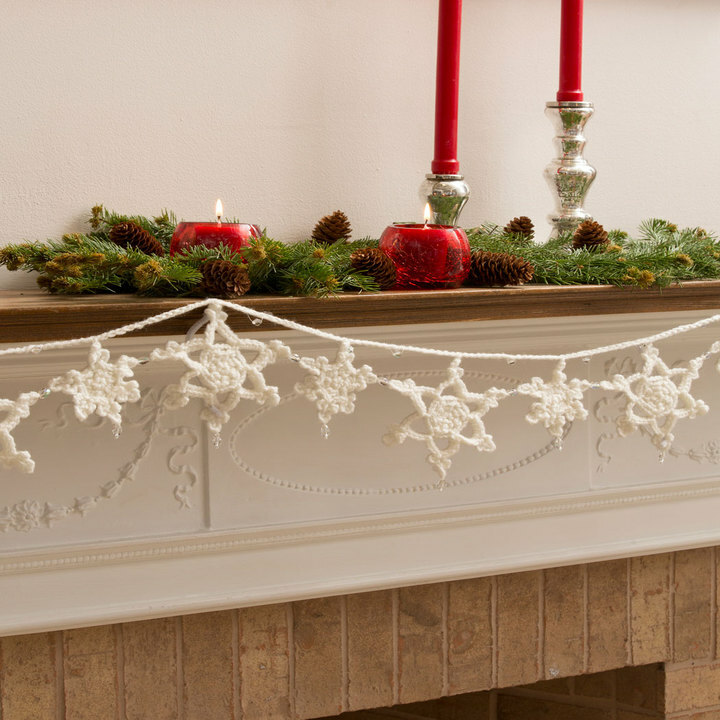 Crochet a garland of snowflakes and transform your home into a winter wonderland! Clear faceted beads add a festive sparkle to this beautiful holiday decoration. GAUGE: Large Snowflake = 5” (12.5 cm) in diameter. Small Snowflake = 3” (7.5 cm) in diameter. CHECK YOUR GAUGE. Use any size hook to obtain the gauge. 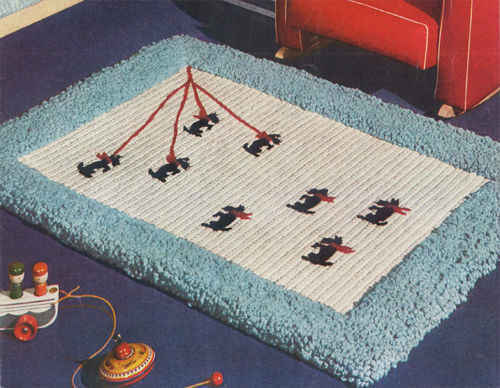 Garland measures 55” (140 cm) long x 5” (12.5 cm) wide. With sewing needle, string 24 beads onto heavy duty thread. Set aside. ch-4 picot: Ch 4, slip st in 4th ch from hook. ch-6 picot: Ch 6, slip st in 6th ch from hook. trefoil: Ch-4 picot, ch-6 picot, ch-4 picot, slip st in base of first picot. beaded chain (bch): Slide bead up to hook, yarn over, draw yarn through loop on hook. Round 1 (right side): Work 6 sc in ring; join with a slip st in first sc – 6 sc. Round 2: Ch 1, (2 sc, ch 2) in each sc around; join with a slip st in first sc – 12 sc; 12 ch-2 spaces. Round 3: Slip st in next sc and next ch-2 space, ch 1, (sc, ch 3) in each ch-2 space around; join with a slip st in first sc – 12 ch-3 spaces. Round 4: *Ch 7, skip next ch-3 space, slip st in next sc; repeat from * around – 6 ch-7 spaces. Round 5: (4 sc, work trefoil, 4 sc) in each ch-7 loop around; join with a slip st in first sc – 6 trefoils. Fasten off. Weave in ends. Round 2: Ch 2 (counts as hdc), hdc in same st, ch 2, (2 hdc, ch 2) in each sc around; join with a slip st in top of beginning ch-2 – 12 hdc; 6 ch-2 spaces. Round 3: Slip st in next hdc, *(slip st, work trefoil, slip st) in next ch-2 ch-2 space, slip st in next hdc; repeat from * around – 6 trefoils. Fasten off. Weave in ends. With A and string of beads held together as one throughout, ch 8, join with slip st in first ch to form a hanging loop, ch 6, slip st in the tip of one trefoil of any Small Snowflake, *ch 15, working 2 bch randomly placed within ch-15 section, slip st in the tip of one trefoil of any Large Snowflake, ch 15, working 2 bch randomly placed within ch-15 section, slip st in the tip of one trefoil of any Small Snowflake; repeat from * until all Snowflakes have been joined to Garland, ch 14, slip st in 8th ch from hook to form a hanging loop. Fasten off. Weave in ends. 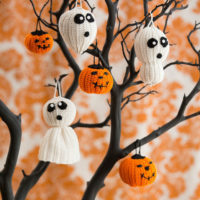 With right sides of Snowflakes facing up, join all Snowflakes together at corresponding first picots below each join to Garland as follows: *With sewing needle and heavy duty thread, attach thread to picot on first Snowflake, string bead onto thread, sew to corresponding picot on 2nd Snowflake. Repeat from * across length of Garland, joining all Snowflakes together. Sew one bead to the bottom picot of each Snowflake. Weave in ends. To keep Large Snowflakes flat, use chenille stems or pipe cleaners. Working from back, insert chenille stem through one ch-6 picot of Large Snowflake and fold end of stem down to secure. Stretch stem across to the opposite point and insert through ch-6 picot, fold down to secure. Trim excess wire. One wire should be sufficient to hold the flake flat. Repeat for other Large Snowflakes. A, B = color A, B; ch = chain; hdc = half double crochet; sc = single crochet; st(s) = stitch(es); () = work directions in parentheses into same st; [ ] = work directions in brackets the number of times specified; * or ** = repeat whatever follows the * or ** as indicated.